It's that time again! Time for family, giving thanks, and, of course, battling to save the world! We've crammed so much into this release that we'll need to hold off on releasing today (Friday) and instead release next Tuesday! Sorry for the inconvenience, but we're sure this update will be worth it. New bots, weapons, missions, achievements, an incredible boss fight, and a new item bank system! There should be something for everyone in this latest harvest release! The evil Chairman Platinum was defeated by the combined efforts of Delta V's warriors and Elon Musk, but while his EbilCorp Factory was active, it stirred something terrible in the depths of Delta V's cavernous interior. This mysterious region of Delta V is known as the Black Abyss. Years after the initial colonization of Delta V, Baelius' scientists concluded that there was nothing of value in this region so it was sealed off from all mining and exploration operations. At least, that was the official story. Once again, Legion and Exile forces are threatened by this fearsome new enemy. If it is not defeated, this may be the last Harvest Festival for the citizens of Delta V. Fortunately, new technology has emerged to help you prepare for the trials ahead! The dark substance that emerged from the Ebilcorp Factory site was unlike anything Delta V scientists have ever seen. Like most new discoveries, however, it was quickly adopted for the manufacturing of new weapons! The Black Abyss Battlegear will be available in physical and energy flavors from an NPC near the current site of the Wasteland's SolarWorld Factory. 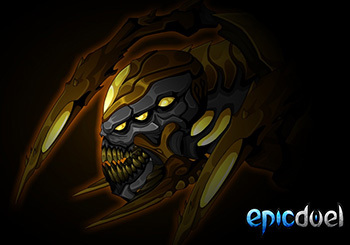 Again, the Black Abyss Battlegear will be available in-game with a new, locked, active core. We'll post more about that as we finalize details. We are also restocking Rabblefroth with the seasonal Thanksgiving rares. Be sure to stop by and check them out if you missed them last year! 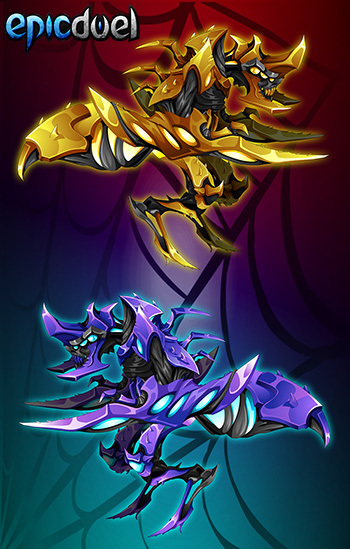 In addition to new weapons, we will be introducing an exclusive new Varium package that will include 2 new bots, the Black Abyss Bots! 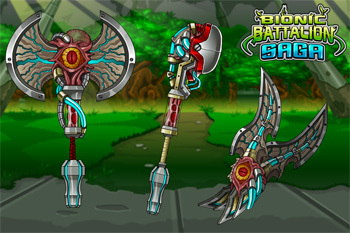 In addition to dealing a devastating slash attack, it is also capable to unleashing powerful secondary skill. Again, we will post more details as they become finalized. An epic-sized release wouldn't be complete without new missions, and new missions wouldn't be complete without new achievements! 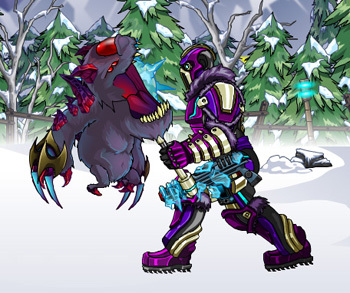 Collect the new seasonal-rare Turkey Terminator achievement from any VendBot. It will only be available for a limited time so get it while you can. 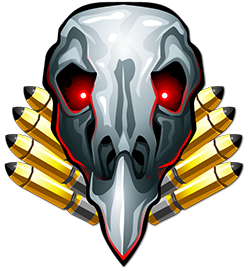 Also, the Hallowarrior Achievement will be leaving to make room for this new achievement, so if you haven't picked it up yet, now's your last chance! New Achievements will also be available for completing the new mission chain related to the anomaly in the Black Abyss. One does not just walk into the cavernous depths of Delta V so level up and perfect your builds for one of the greatest challenges yet! In a future release, we will allow players to tag items with custom labels so they can easily be found, ex: "Beta Build", "My Alpha Gear", "Defeat Titan Set"
Stay tuned for more updates on this epic upcoming release! Just a friendly reminder that the Are You Yeti shirts are now available at HeroMart! The Yetis are not currently available in game, so the shirt might be the quickest way to get your hands on a Yeti, particularly the new Dark Yeti! 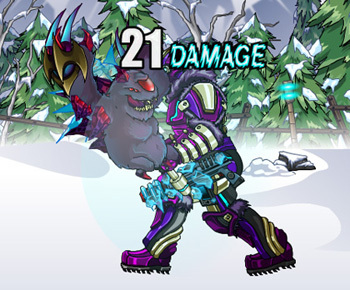 The Dark Yeti offers an energy-based alternative to the classic Baby Yeti's attacks. When Omega goes live, you will be able to upgrade it to the Omega Dark Yeti! 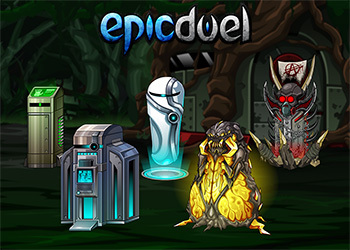 Along with a Baby Yeti and Dark Yeti in EpicDuel, you will also receive a Baby Yeti Battle Pet in AQW! Shirts are a real limited quantity item. There are only so many, so once they're gone, we're very unlikely to reprint more. Get a shirt, save three yetis! Can't beat that! Mr. Scrabbles approves! Happy Holidays! I look forward to continuing Omega development in the frosty Northlands. The Infernal Infiltration War is winding down, and while the Exiles have a significant lead, the Legion can’t be ruled out just yet! Remember to use those grenades -- you can resell them for credits after the War is over, but it isn’t worth stockpiling them, and grenades are happiest when thrown. When the War ends, the bombs will no longer be available, nor will the missions to get bombs. In addition, the Alignment-specific cruisers will go rare. However, neutral mechachillid cruisers will still be available. As mentioned before, the alignment to power through this final Vault door first will win the Infernal War, as well as control over the Infernal Mines. Not enough for you? How about a new bot? 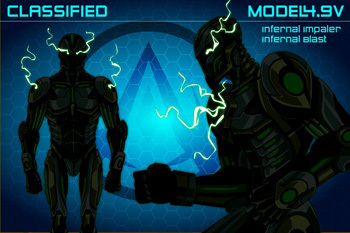 The Infernal Android will be available first to the winning alignment, and its special attack is related to its origin in the Vaults; the longer a battle lasts, the more damage the special attack does! As mentioned just up there, the winning alignment will have first stab at using it, and the Infernal Android comes in both varium and credit-only flavors. Also, the first alignment to breach the Delta Vault will receive the Infernal Conqueror achievement worth 2500 rating points! The other alignment will still receive the Break On Through achievement worth 950 rating points! I would show the artwork for the achievements, but they're a bit...spoilery. As we wrap up the war we are turning our attention to systems that could be improved, such as boosting. The revamped boost system will allow you to boost based on duration or number of rounds, and we will be introducing a new credit boost, which many of you may have figured out from the new end battle screens. There is a lot of build with this new system so it may not go live this week, but it will definitely be available next week. Why didn’t I announce this in the last design notes? Well, I’m remote staff, so I find out for sure what’s going to be in the update on Monday or Tuesday, and write the design notes based on that. Occasionally, Titan and Rabble look at each other and decide yes... we can fit more into this update. They then add a feature that I don’t find out about until testing. Our favorite cheeseburger-loving Physical God is turning another year older this week! He hasn’t asked for any missions, but it’s possible that Titan has forged in his mighty foundry an item of such power and inanity that it cannot be comprehended. I’m likely not going to be writing the DNs or have much to do with the game or development next week, as I will be doing field work at another university across the country from where I live. Maybe I’ll post pictures on my Twitter! Have you ever seen scars on fruit or flowers? Or seen a tiny insect crawling inside your LCD screen? Then chances are, you have encountered a thrips. Thrips are tiny insects (as small as 1/25 of an inch) with fringed wings belonging to the order Thysanoptera. They typically feed on plants by puncturing the plant with their mouthparts and sucking out the delicious juices. Because they serve as a vector for several plant viruses including Tobacco mosaic virus, thrips are considered pests by farmers. We need to lighten up the mood a little bit around here- after the tragic loss of Administrator 12 at the radioactive hands of Alydriah's lackey, I think we all need a little rest. 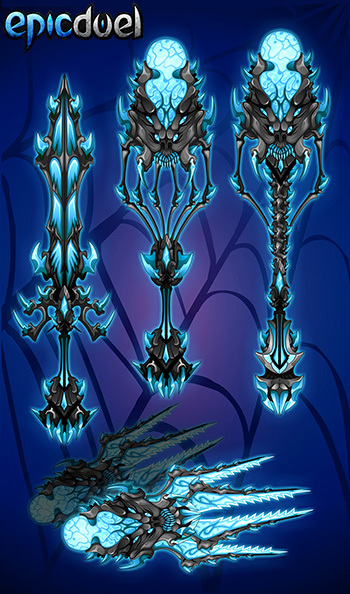 This week is going to be focused on the new gear as well as give us a chance to prepare for the next big story arc. In the weeks to come, expect more missions, features and unique NPCs as we explore Delta V's greenest zone. With the Azrael pack going rare, we are introducing a new Spring Promotional Pack! This awesome assortment includes the Bionic Battlegear drawn by Nightwraith during his Livestream and the new bot: The BioBorg. 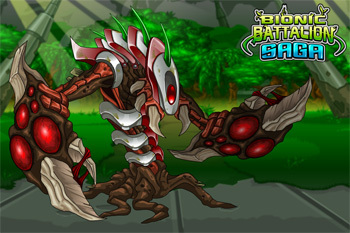 The Bionic Battlegear features a potent new skill: Thorn Assault. 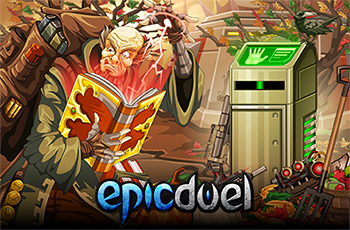 Each normal strike will offer the chance to unleash a flury of metal barbs against your foes! The bot's special skill is a unique new buff called Thorns. 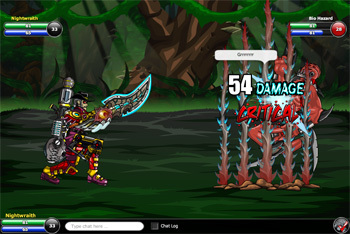 This potent buff reflects a large portion of damage dealt by a melee attack back at the attacker. This will make high damage dealers think twice before trying to deliver that knockout punch! Along with being available for free with the largest Varium package as soon as our release goes live Friday, these promotional items will also be available in-game from your favorite squid-headed archival alien, Xraal in the BioDome! 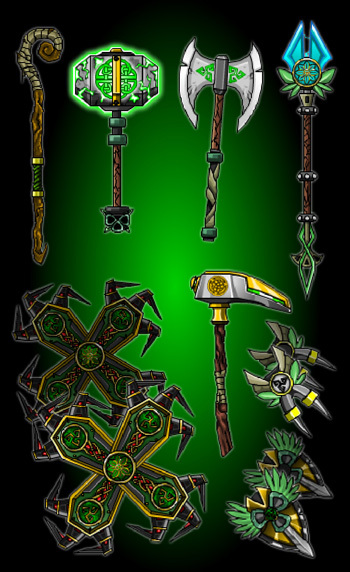 The Celtic Weapons with the special ability Lucky Strike, which increases your chance to connect a strike by 7% will be returning this week. They are replacing the Heartbreaker weapons, so if you want to grab one of the Heartbreaker weapons now is your last chance to do so this year. The Biological Preserve is not only home to plants and Hazards, but also cute little fuzzy lagomorphs- the Bunnies! However, some of the bunnies have chewed through their protective caging and have escaped to other areas of Delta V. Are they just adorable or have some master plan?